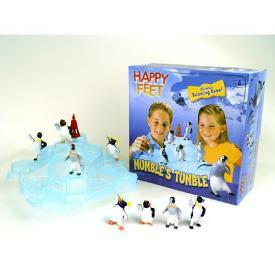 My Family Fun - Happy Feet Mumbles Tumble Try to balance penguins on an beautiful iceberg! Try to balance penguins on an beautiful iceberg! It's the ultimate balancing board game as players try to balance all of their Mumble, Gloria, Lovelace and Ramon plastic molded penguins onto the wobbly iceberg without having them all tumble. Game includes 20 penguins, game base, iceberg, buoy, and instructions. Plastic. 2-4 players. Ages 5 and up.